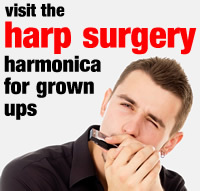 The harmonica? He’s mad ferret! Here’s a top tip for all you ferret owners. If you can’t find your polecat, just play your harmonica; he’ll be right there.